The LG G7 is expected to arrive next month and with it could be one of the most impressive LCD displays ever placed in a phone. This not only means a higher picture quality but a whopping 35% saving on battery drain too. The screen, according to Venture Beat, will be called an MLCD+ and feature a 6.1-inch form with an eye melting 800 nits brightness. This should make for tip-top quality contrast, ideal for HDR10 content, yet it does so while making that 35% saving on battery. Check out the below image as previously reported here when it appeared online and was swiftly taken down again. There should also be a top-notch on the edge-to-edge display, much like the iPhone X. 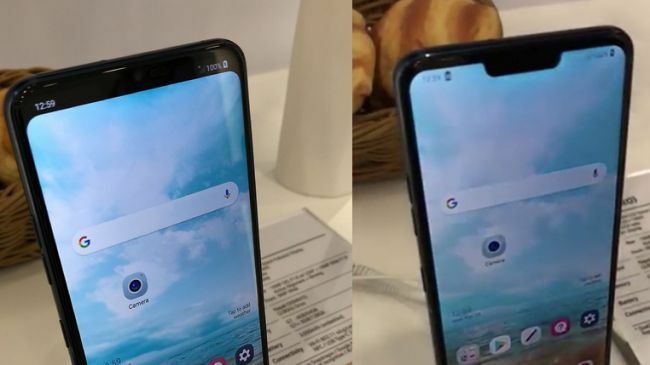 However, according to a video from behind closed doors at MWC 2018, the LG G7 will have an option to mask the notch. This is done by blacking out a top bar, but still displaying time and battery – as shown in the top picture. Other specs expected on the LG G7 include a Qualcomm Snapdragon 845 processor backed by 4GB of RAM and 64GB onboard storage. The phone should be IP68 dust and water resistant and pack in a 16MP snapper or two on the rear with f/1.6 aperture. There is also expected to be wireless charging, voice controls and AI powered camera features built-in as unique to LG. LG is expected to reveal the G7 in April ready to go on sale in May where it is thought to be priced similarly to the LG G6 at around £570.